Sign-up rates for Obamacare health coverage have fallen 11 percent from the same time last year, but at least part of the decline is being attributed to something good. Donald Trump‘s changes to the ACA are still being blamed for a lot of the drop. 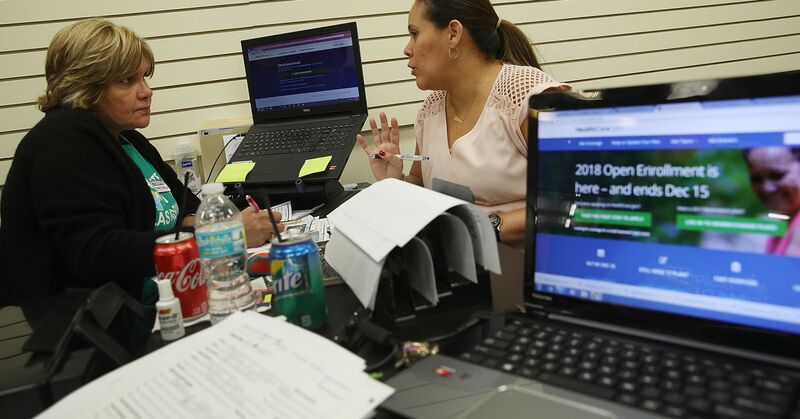 It’s the first enrollment season since Congress repealed the so-called individual mandate, a key part of former President Barack Obama‘s health-care law. The mandate imposed a tax on the uninsured to persuade people to buy insurance instead of paying a penalty. The repeal of the federal mandate last December, along with Trump’s push for cheaper, less comprehensive short-term health plans and a substantial slash in outreach funding, was expected to damper ACA enrollment rates this year. Consumers still have another week to sign up, so researchers can’t draw any hard conclusions until the final numbers are in. Policy experts are also taking a close look at states like New Jersey, which enacted its own individual mandate in May. As of Dec. 1, the Garden State saw enrollment numbers down 13 percent compared with the same time last year, according to figures released by the Centers for Medicare and Medicaid Services. Regardless, the tight labor market is helping reduce dependence on the federal program, said Joel Cantor, the founding director of the Center for State Health Policy at Rutgers University in New Jersey. The unemployment rate in New Jersey is at its lowest level since June 2001, according to Bureau of Labor Statistics data. It fell to 4.1 percent in October after remaining at 4.2 percent for three months. The national unemployment rate is 3.7 percent, its lowest level since 1969. Chris Sloan, director at Avalere Health, thinks it’s too soon to quantify whether higher employment, the end of the mandate penalty or short-term plans are impacting overall exchange open enrollment. He notes that the exchange market is primarily a low-income market of people who receive subsidies. “It’s way too early; we don’t have any way to quantify these effects yet,” he said. Additionally, Sloan doesn’t think the end of the mandate is a big deal, because it was so easy to get out of it even during the Obama administration. “The Obama administration, and subsequently the Trump administration, did not enforce it; and it’s hard to have a powerful mandate if the administration is giving millions of exemptions and creating really broad exemption categories which the Obama administration did for political reasons,” Sloan said. However, she added that the economic impacts on health coverage would vary by state. Massachusetts, Vermont and the District of Columbia, which operate on locally run exchanges, have also passed laws restoring the individual mandate. As of Nov. 26, enrollment in Massachusetts is up 4 percent compared to last year. Massachusetts’ unemployment rate was 3.5 in October. Data isn’t yet available in Vermont and D.C.
Nearly 90,000 people have signed up for health coverage through New Jersey’s Obamacare marketplace so far this season, CMS data show, down from 104,142 this same time last year. Meanwhile, Democratic New Jersey Gov. Phil Murphy’s administration has been pushing for public awareness on open enrollment. On Monday the governor warned residents they had 12 days left to sign up for coverage. Cox of Kaiser said it’s worth considering whether New Jersey residents knew the state enacted its own individual mandate and assessing how big the New Jersey governor’s outreach was. Cox also said it’s worth seeing whether the newly created jobs in New Jersey provided health coverage. Judy Solomon, a senior fellow at the Center on Budget and Policy Priorities, a Washington think tank, said the tighter labor market could possibly be playing a factor in lower enrollment but qualified that it would likely vary by state. Solomon said it’s worth waiting until the Dec. 15 deadline before reaching any conclusions. Most policy experts expect to see a surge in enrollment as states near the mid-December deadline. —CNBC’s Bertha Coombs contributed to this report.